"You! You are still dangerous. But you can be my wingman any time." The Philadelphia Eagles are about to play in a Super Bowl for the first time in 13 years, led by a quarterback in Nick Foles who went 4-1 down the stretch, including a pair of playoff wins over last year's NFC champs and the No. 1 defense in the NFL. 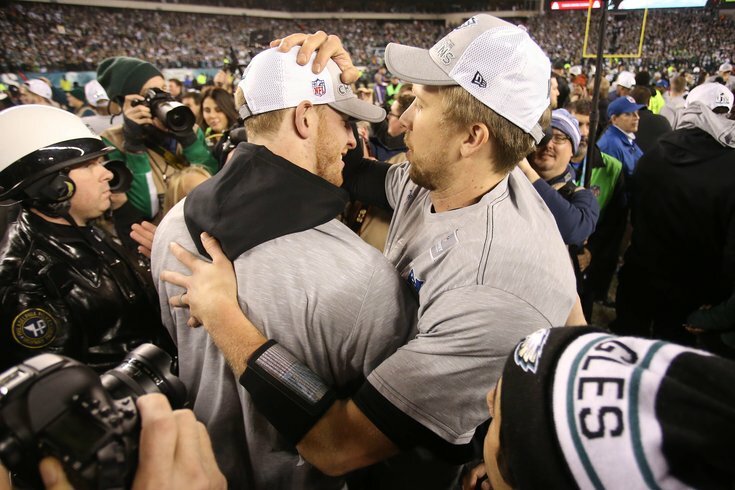 There may not be a franchise in sports whose fan base desperately wants them to win it all more than Eagles fans do, and should he pull off the upset victory, Foles will be a hero in Philadelphia, for life. The Eagles should also probably trade him, as there is zero question, regardless of the outcome of the Super Bowl, that Carson Wentz is the Eagles' starter going forward, with Foles resuming his role as the backup. The only question is when will Wentz be ready to return? In an impromptu press conference on Friday, Wentz told reporters that he expects to be back out on the field in time for the Eagles' season opener in 2018. Oftentimes players will be overconfident in their timetable for return, however, according to Les Bowen of the Daily News, the medical staff agrees. An Eagles medical source corroborated Wentz’s recovery timetable to the Inquirer’s and Daily News’ Les Bowen Friday. The source told Bowen that Wentz should be ready for the start of the season. He added that the quarterback won’t be 100 percent by then, but that it will be safe for him to play. Wentz said that his LCL was torn in addition to his ACL, which is something that Dr. David Chao of the San Diego Union-Tribune speculated soon after the injury occurred. Dr. Chao wrote on Friday that adding an LCL tear into the mix will not extend the timetable for return from the ACL tear, rather, it just makes the rehab a more difficult and will limit what Wentz can do on the field during his initial return. At this point, it is still reasonable to hope Wentz can be ready by Week 1. If that happens, he will almost certainly be limited to being a pocket quarterback. However, there is no guarantee Wentz will even be ready to take the field by then. Having a second (of four) main ligament torn in the knee does add complication to the recovery. And recovery for two ligaments is more arduous than for one. We have said since the injury occurred that he won’t be his usual run-pass threat until later in the season. It could even be 2019 before he returns to that form. Had Wentz's projected timetable for return been somewhere deeper into the 2018 season, Foles' value to the team going forward would be far greater, as he could be the starter early in the season until Wentz is ready to return. However, if the Eagles are indeed confident that Wentz will return on time for Week 1, Foles is probably more valuable to some other team than he is to the Eagles. The Eagles will be in the enviable position of being able to hold onto Foles as insurance if no worthwhile offers are forthcoming, while being able to pull the trigger on one if it presents itself. The better outcome for the Eagles is probably the latter, seeing as Foles would almost certainly bolt for free agency when his contract expires after the 2018 season anyway, so they may as well be compensated with a high draft pick rather than lose him for nothing. It's also worth noting that Foles is slated to become more expensive in 2018, when he will count for $7.6 million on the salary cap, $5.2 million of which the Eagles would save if they traded him. For a team that is tight against the cap, that money could go toward other important matters, like re-signing free agent-to-be LB Nigel Bradham, or helping get a contract extension done with players whose contracts are set to expire after the 2018 season, like DE Brandon Graham, LB Jordan Hicks, CB Ronald Darby, or RB Jay Ajayi. If talking about trading a player who is about to lead the Eagles into the Super Bowl sounds cruel, it shouldn't, by the way. A trade of Foles would probably benefit Foles himself most of all, assuming he has aspirations of being a full-time NFL starter once again. In Philadelphia, he'd be a backup. He'd be a highly decorated backup, but still just a backup. Somewhere else, he could potentially once again be "the man." I'm sure Foles would kindly ask, however, that he not be sent anywhere near Jeff Fisher this time around.